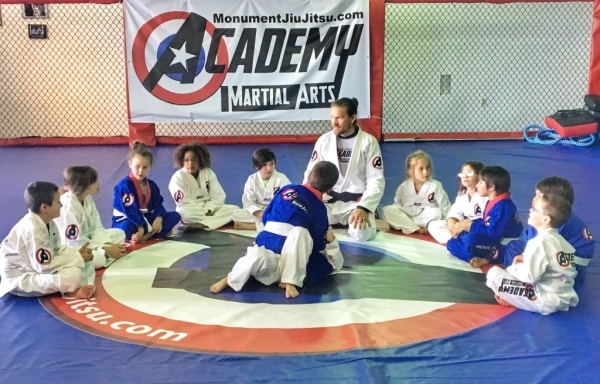 Kids Martial Arts in Monument, CO 80132 offering Brazilian jiu jitsu, combined with Taekwondo and boxing. Thank you for your interest in our Kids Martial Arts programs. We offer a free evaluation class to see if we are a good fit for you and your child, and to decide which program would best fit you and your child's needs. We offer a combination of Brazilian Jiu-Jitsu (ground grappling/ self- defense) and Taekwondo (kicking and punching), and all classes are taught by a black belt. We also cover character development skills in every class such as confidence, focus, and respect. 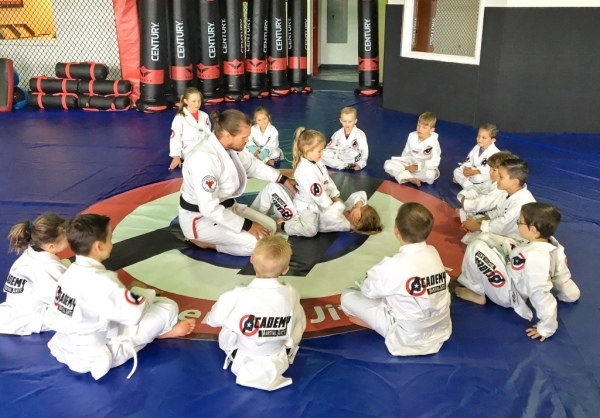 A trial class is a great way to introduce your child to martial arts classes and get them comfortable without them feeling like the new kid who doesn't know what to do in class. We make our trial class fun but also challenging. This will give you both an idea of what to expect in a typical class. Brazilian Jiu-Jitsu is a martial art/ sport/ self-defense that teaches the smaller person to use leverage and technique to defend against a larger attacker. More commonly known as a grappling art that works best for self-defense. While Taekwondo is also a martial art and Olympic sport it emphasizes kicking and punching techniques. 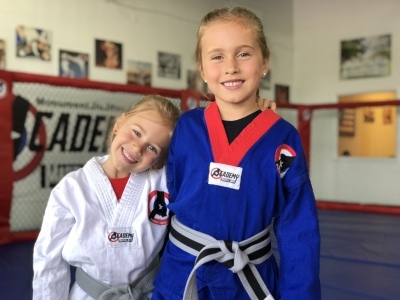 By offering both, it allows your child to become the most well rounded martial artist possible in a fun, friendly, and safe atmosphere. They will have fun while learning great self-defense skills as well as building their confidence and focus to become their best self possible. If you have any questions please give us a call, register online for the FREE class or feel free to stop by. Join our Free Evaluation Class THIS SATURDAY at 10am. We offer the Best Kid's Martial arts classes in Monument, Colorado. ​​Our Children's Martial Art program emphasizes character building. We have a level based, goal oriented program that helps the child with Focus, Confidence, Perseverance, Self-Control, Discipline, Respect, and Integrity. We use socially aware and school appropriate methods for self-defense. Empower your children to have the confidence to know the difference between when it's ok to walk away, and how to de-escalate a potential confrontation with the right language, and when the situation calls for physical self-defense. Do not let your child go through school or life being bullied. Help them to embrace their personal power. We can teach them how to defend themself without necessarily hurting someone else unless the absolute need arises. We focus on character development so that they do not go through life thinking of themselves as victims, but rather as superheroes, all while teaching them physical and social skills to accompany them for life. ​The programs are designed to build your child's confidence, while teaching them realistic life skills that will prevent your child from being bullied, and teach them the responsibility of never becoming a bully. Martial Arts classes are offered for the Monument, Woodmoor, Palmer Lake, (Tri-lakes) area for ages 4 and up. 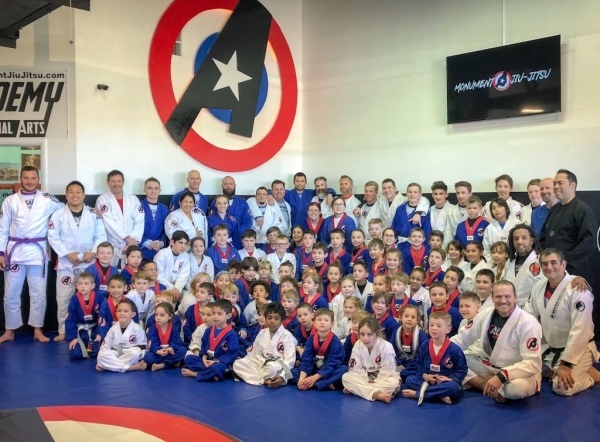 We focus on character development, self-confidence, self-defense, discipline, goal setting, and the importance of hard work in a safe enjoyable atmosphere. In the children's programs we combine several martial arts to give them the best foundation from which to grow. This program is based on a well rounded approach which also gives the child the best bully-proofing available. Our curriculum is goal oriented, so the parent and child know what they need to learn next to continue progressing. Your child will develop increased focus and concentration. 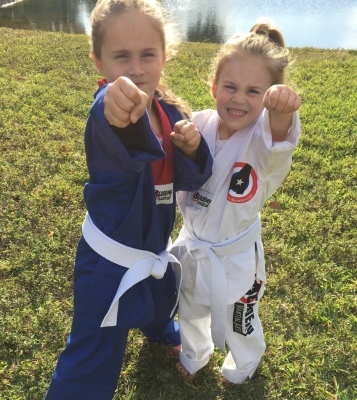 They will understand the importance of using self-control, respect for others, how to be a leader, and their self-confidence will grow as they become fit and learn how to defend themselves. Safety and self-defense for a child is just as much about knowledge, communication, and prevention as it is about actual physical techniques. Martial Arts is not just another after-school activity! Basketball, soccer, and baseball are all great activities for children, but training at Academy Martial Arts we concentrate on character development. Our exciting yet disciplined classes focus a child’s attention, thus improving your child's ability to learn. Learning new things builds a sense of accomplishment. With each new accomplishment a student’s self-confidence grows, and confidence is the first step in their empowerment. Once we begin to develop a student’s self confidence, we are then able to instill the values of respect, courtesy, and integrity. Your child will develop perseverance. Instilling a non-quitting spirit helps a child overcome challenges, to succeed in the face of adversity, and to be a goal-Setter and a goal-Getter. It ensures that they will have the confidence in themselves and the character to make the right decisions when confronted with negative peer pressure.